Congress this week scrambled to finish several pieces of business, from increasing aid to Israel to addressing the child-migrant crisis and patching the Highway Trust Fund, before leaving Washington for its scheduled August recess. But being out of town may not noticeably affect Congress’ legislative productivity. Digital Accountability and Transparency Act — makes data on federal spending more accessible. What’s the reason for the low legislative activity? President Obama and the Democrats who control the Senate blame Republicans for wasting time on measures that have no chance of becoming law, while House Republicans accuse Senate Majority Leader Harry Reid of deliberately sitting on House-passed bills for political gain. Members of Congress tend to act like harried undergraduates, leaving their hardest assignments till the end of the term and then finishing with a blizzard of activity. Among the past seven Congresses, between 39% and 59% of all the substantive laws they passed came in the last five months of their respective two-year terms; the average was 49%. 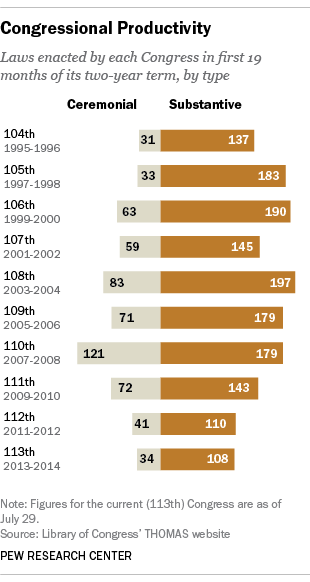 So politics aside, recent history suggests that there’s still time for major legislation to emerge from the 113th Congress.